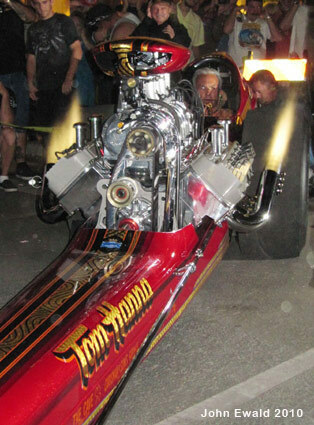 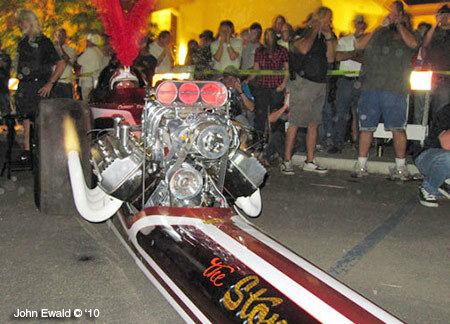 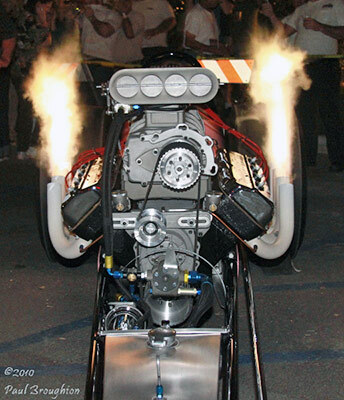 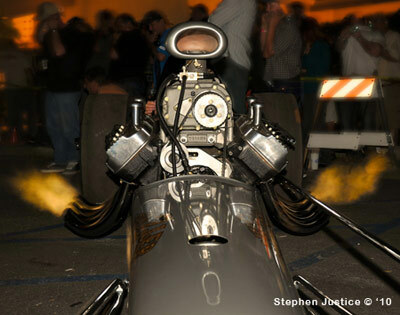 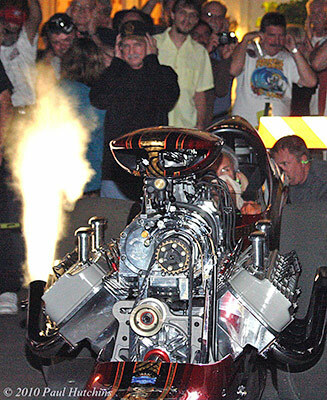 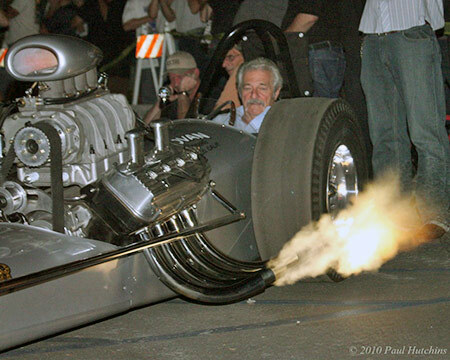 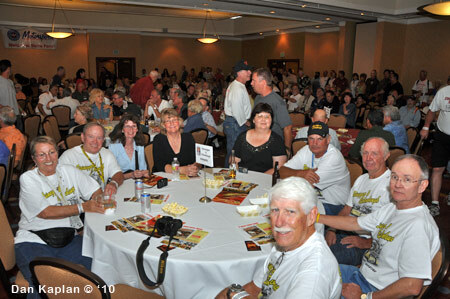 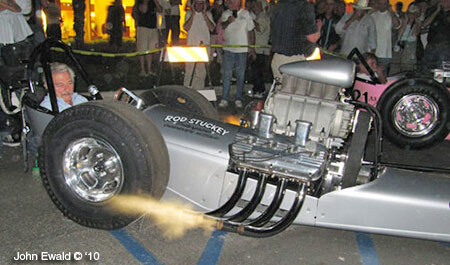 Bakersfield, CA - October 15, 2010: Friday night at the CHRR is one of drag racings major social events of the year. 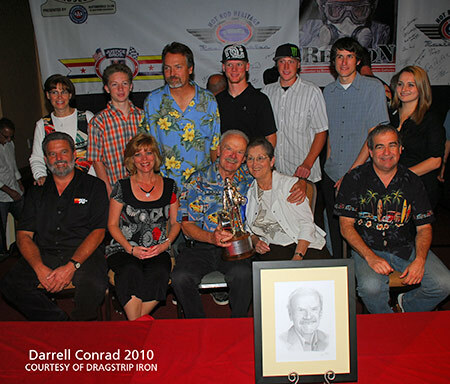 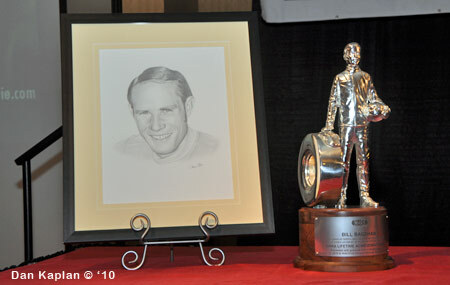 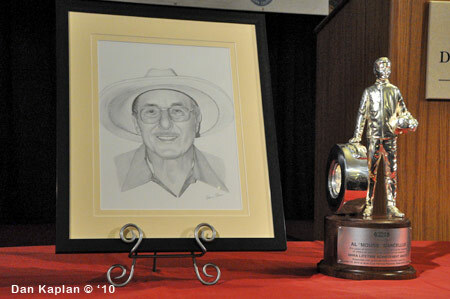 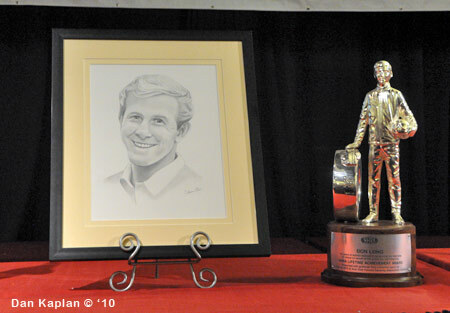 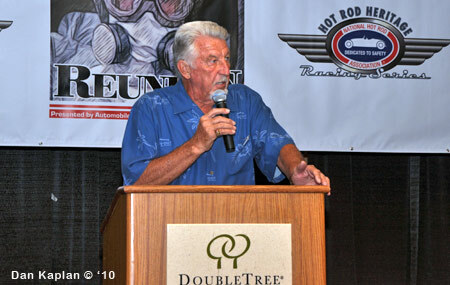 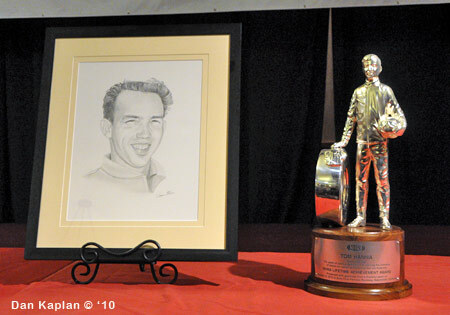 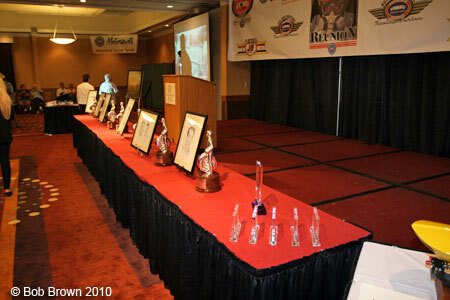 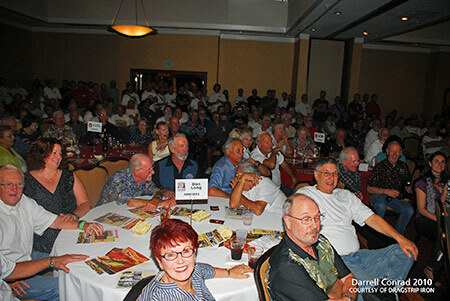 Hosted at the DoubleTree Hotel, the Honoree Awards Ceremony always draws the who's-who of drag racing. 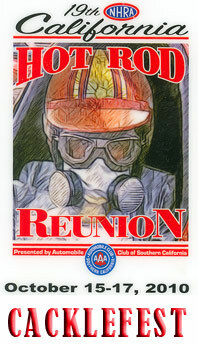 It's a great time to see old friends and meet new ones. 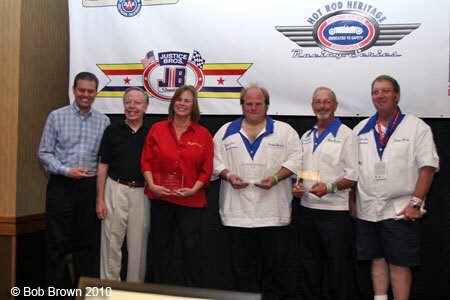 The 2010 Honorees were Bill Bagshaw, Don Long, Al Mousie Marcellus, Tom Prufer, and the Steinegger and Eshenbaugh Team. 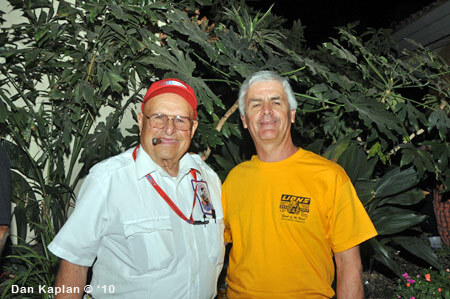 Leading these legends to the annual festival was Grand Marshal Tom Hanna. 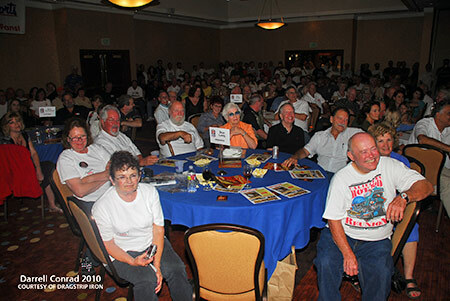 Before and after the presentations there was a ton of visiting. 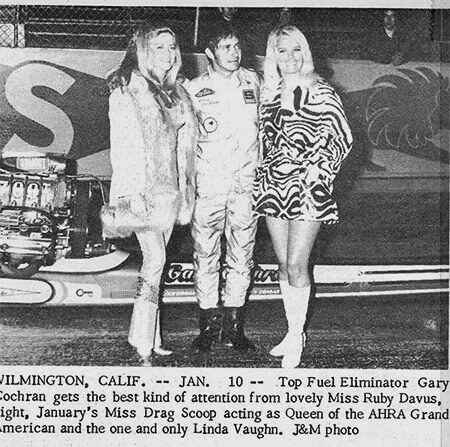 Jerry Ruth, meet Linda Vaughan. 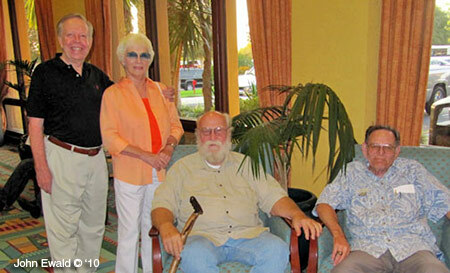 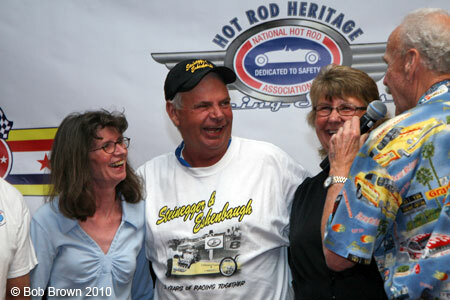 Tom Ivo, Evelyn and Kent Fuller with "Jet Car Bob" Smith. 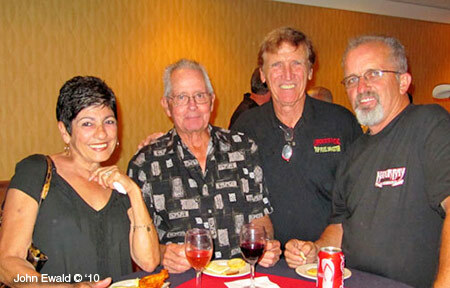 Marie and Gary Cochran, Bob Muravez and Willie Stone. 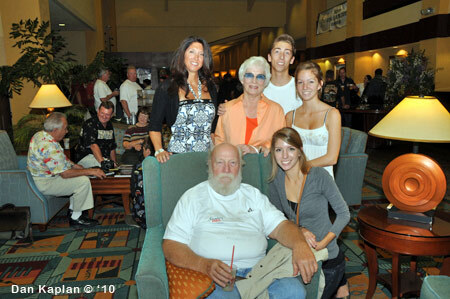 Unfortunately Marie slipped going back to their room later that night and broke her hip. 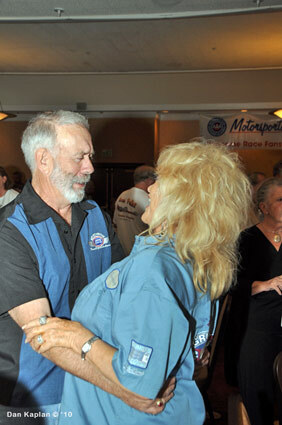 She is healing back in Arizona. 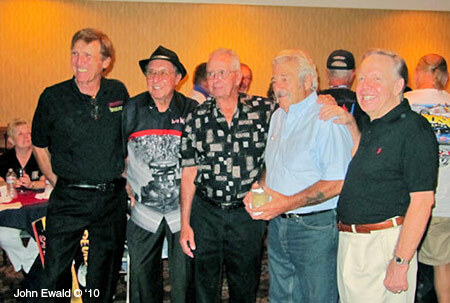 Floyd, Mousie, Mr. C, The Greek and TV. 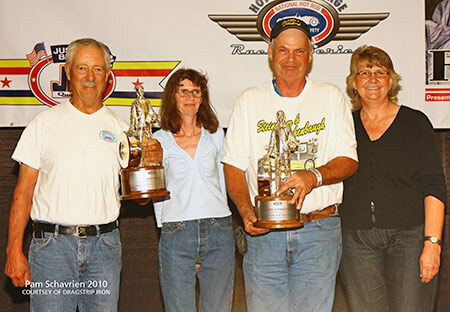 Don Ewald, Darrell Conrad and Pam Schavrien. 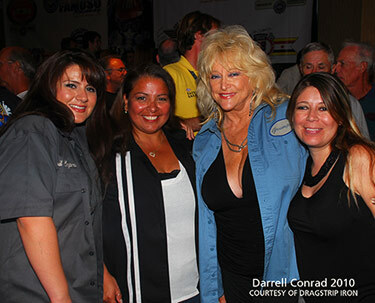 Monique Valadez, Manager of Education and Public Relations for the NHRA Museum, Rose Pohorely better known as Rosebud of the Museum, Linda Vaughan and Graciela Sanchez of NHRA. 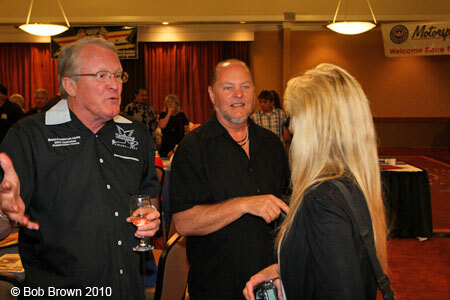 Gary Cochran played wine steward toTom & Kay Hanna . 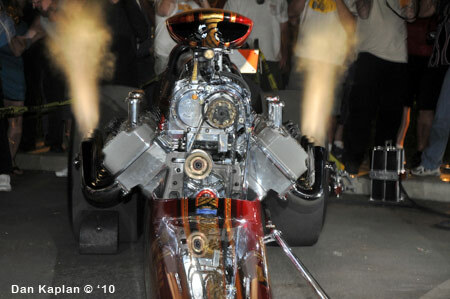 Its blond out! 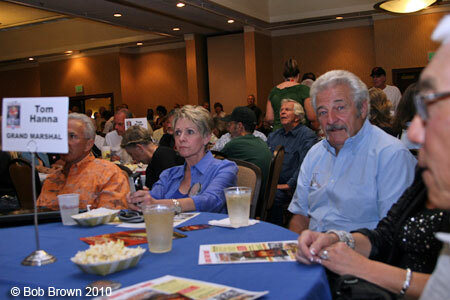 Project 1320 founder, Traci Hrudka and the lovely Linda. 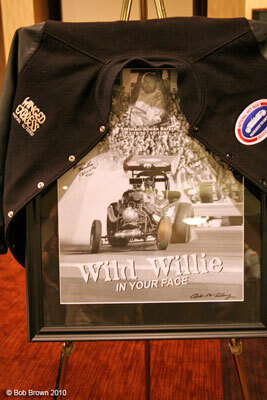 There were some very cool aucton items with the receipts going to the museum. 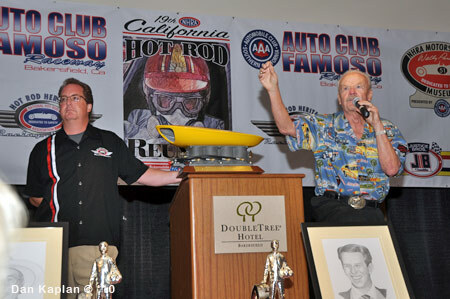 MC Dave McClelland opened by announcing the release of the first two issues of Drag Sport Illustrated a dual CD set. 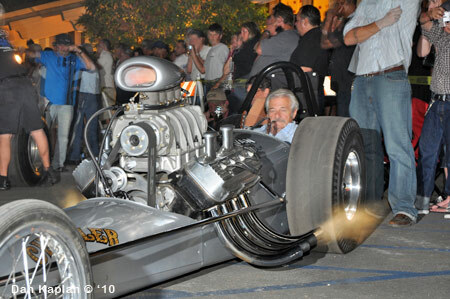 The Greek and his "look". 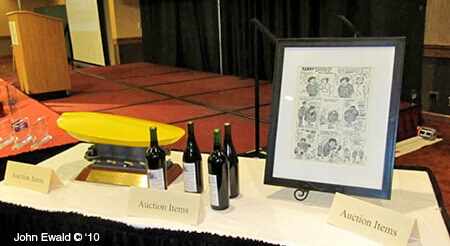 The first auction item was an original Pete Millar cartoon framed and signed donated by Orah Mae and Robin Millar. 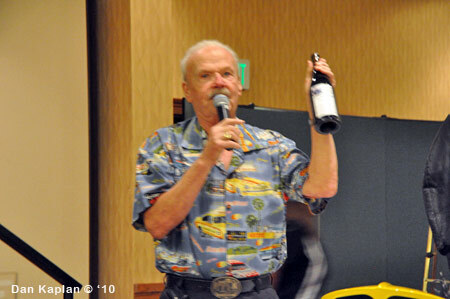 There were several bottles of fine wine on the block with the lovely Sharon Muravez winning the first. 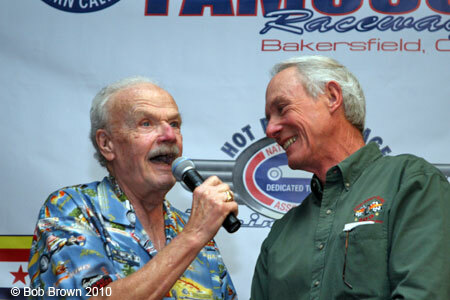 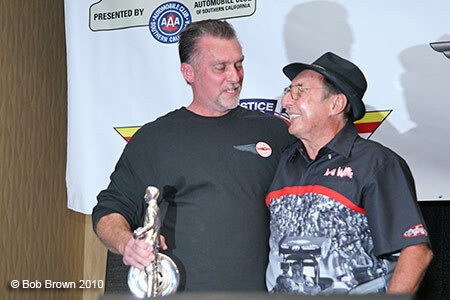 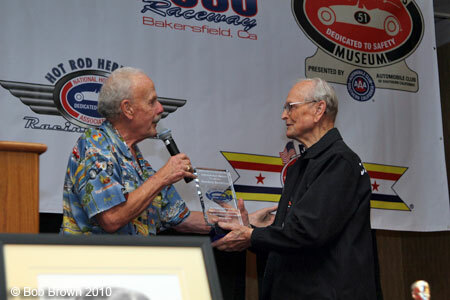 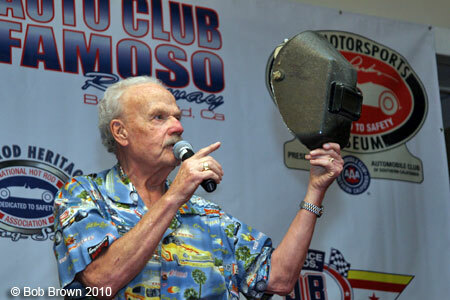 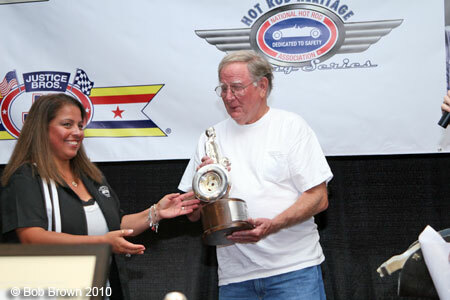 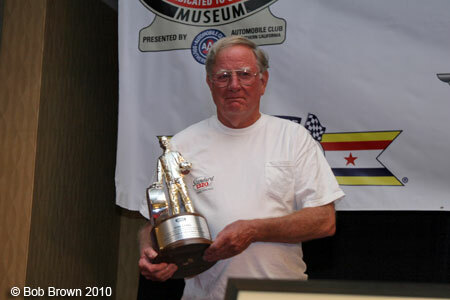 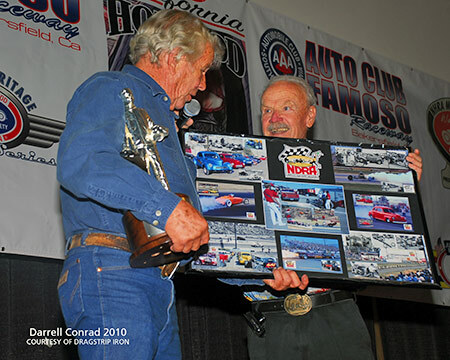 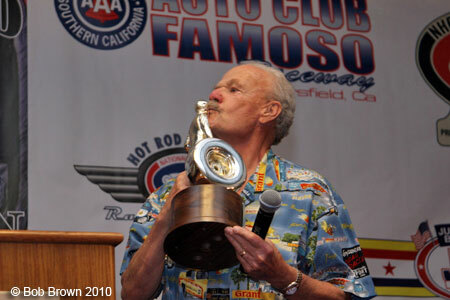 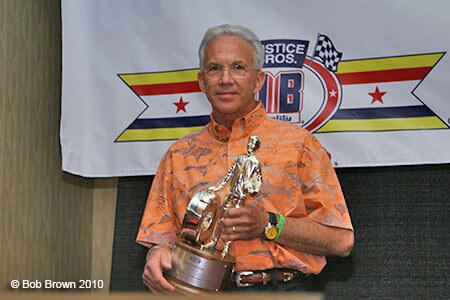 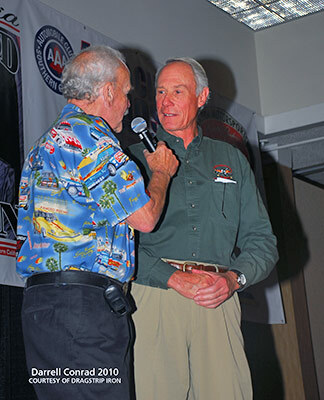 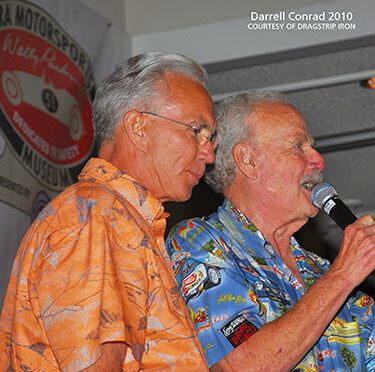 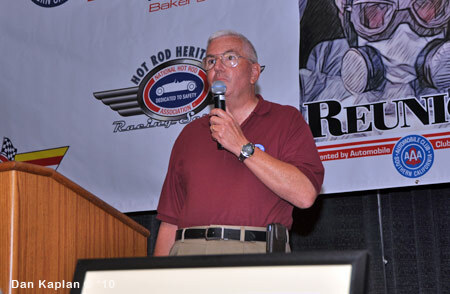 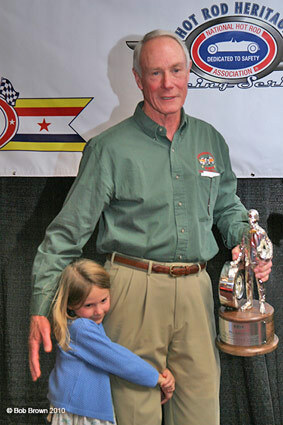 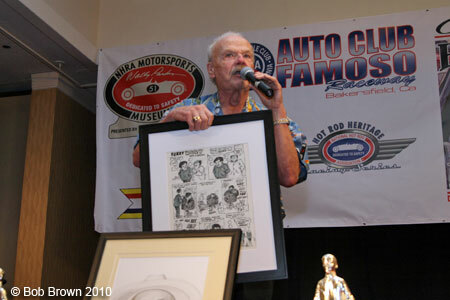 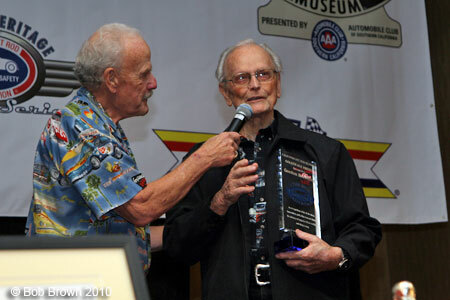 Steve Gibbs caught everybody by surprise, including Dave McClelland, when he gave Big Mac a Wally for his decades of service to drag racing in general and the NHRA in particular. 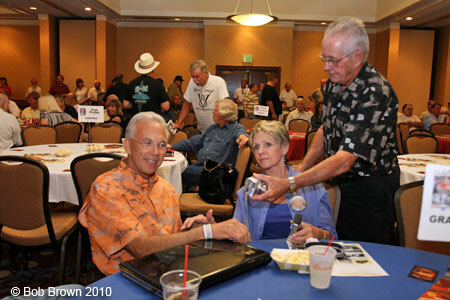 It was a very popular gesture. 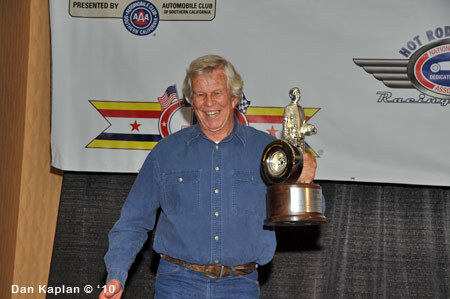 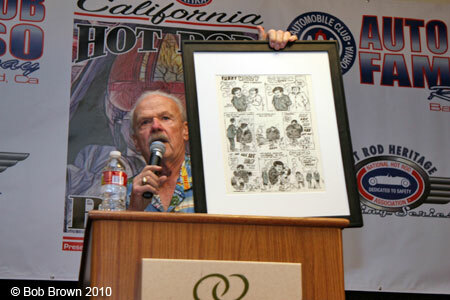 Gordon Browning received the Golden Age Award. 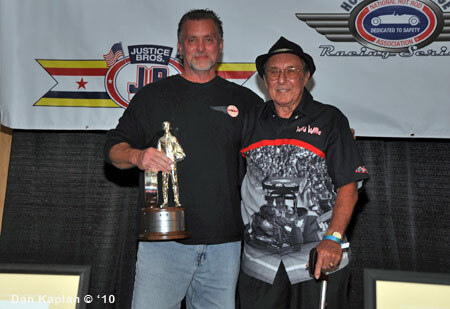 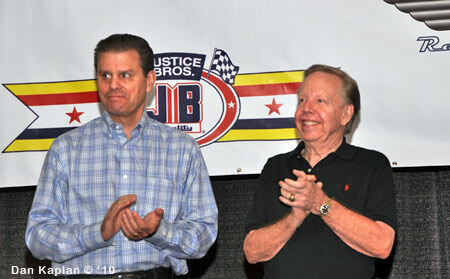 Ed Justice Jr. and Tom Ivo presented the Jungle Jim Funny Car Team and "Jungle Pam" Hardy with the 2010 Justice Bros. 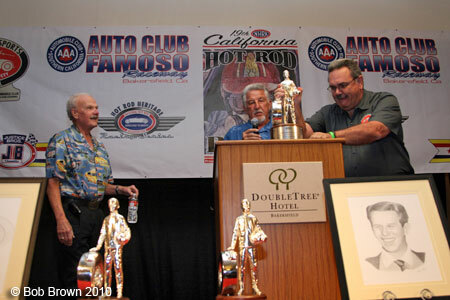 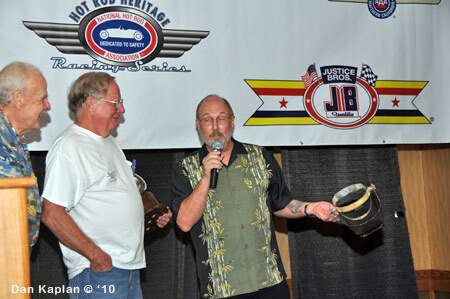 Car Care Products Spotlight Award for their contribution to the early days of drag racing and their continued dedication to the sport in the memory of Jungle Jim Liberman. 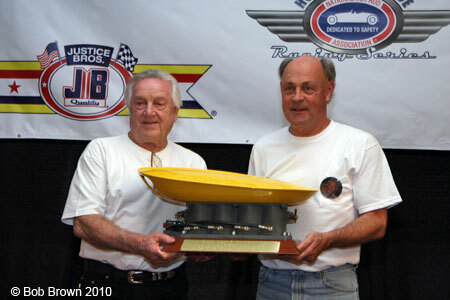 The next item up for bid was a replica Greer-Black-Prudhomme scoop mounted on a set of real Hilborn upright injectors. 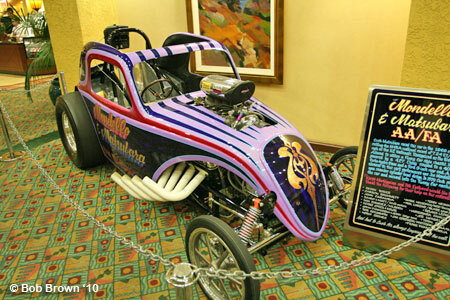 Steve Davis built this magnificant piece with Junior Conway doing the paint. 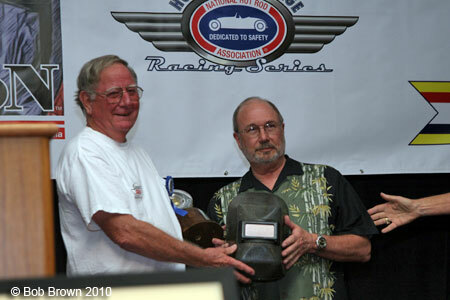 Davis (right) with the winner who paid in excess of $5000.00. 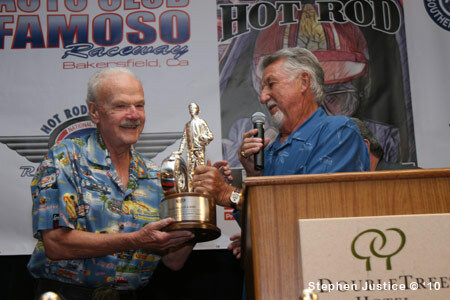 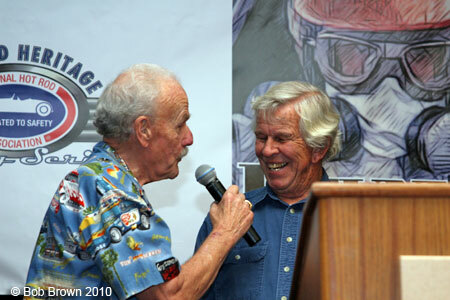 The first Honoree was SS and Pro Stock star Bill Bagshaw. 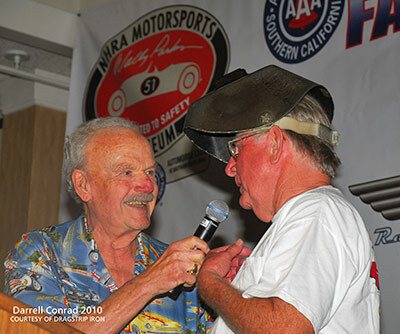 The next honoree was Don Long who also donated this garden variety welders mask. 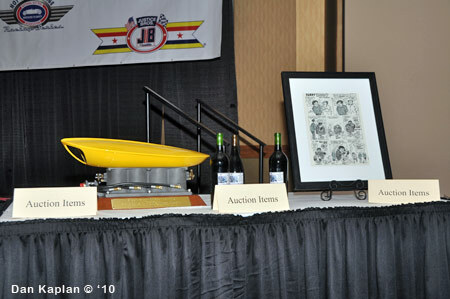 The rib was it was signed by Don Long, Woody Gilmore, Kent Fuller, Steve Davis, Pete Eastwood and Tom Hanna. 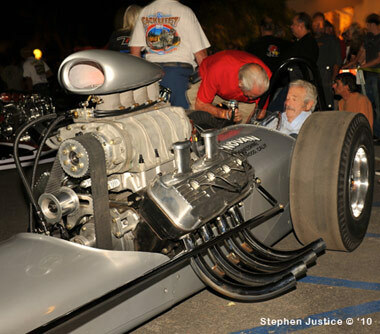 The inside joke was that Long was wearing a Kent Fuller T-shirt while Fuller, sitting at the Long table, was wearing one of his. 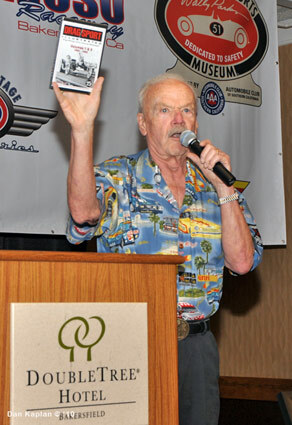 Before the auction proper Rose Pohorely better known as Rosebud of the Museum awarded Long his Wally. 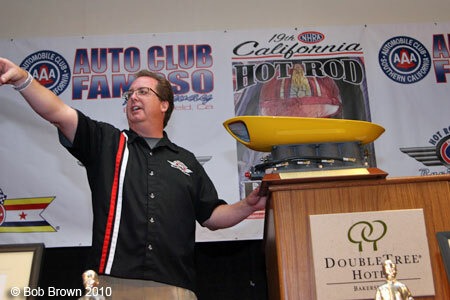 Now the shocker... it sold for $5500.00! 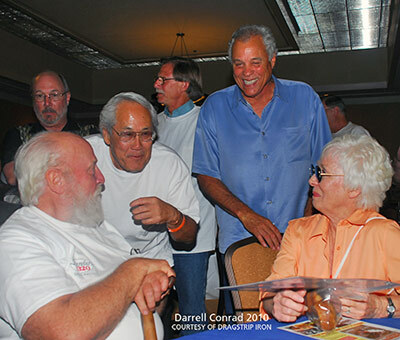 Fuller, center, couldn't believe it. 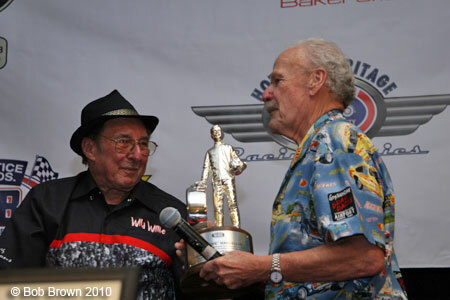 Mike Boyd helped Mousie with his Wally... or maybe he kept it. 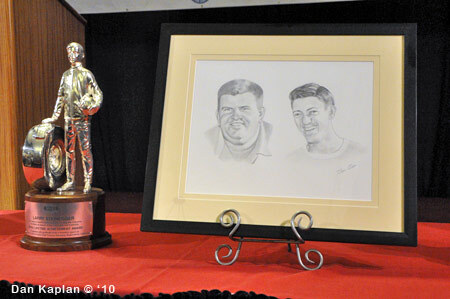 Steinegger and Eshenbaugh were the last of the Honorees. 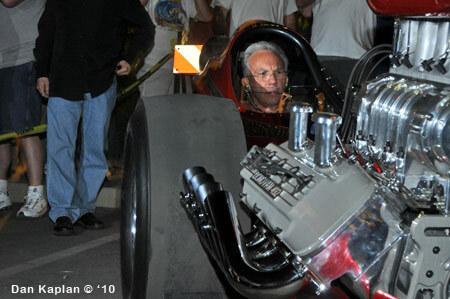 Enough cannot be said about the talents and class of the 2010 Grand Marshall, Tom Hanna. 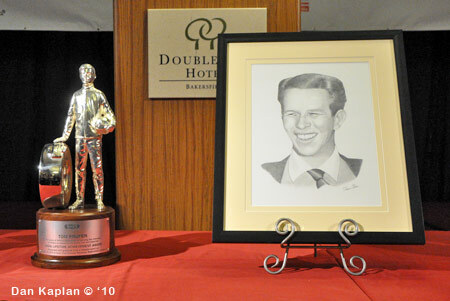 His acceptance speech, which he composed on his laptop, was eloquent, funny and right on point. 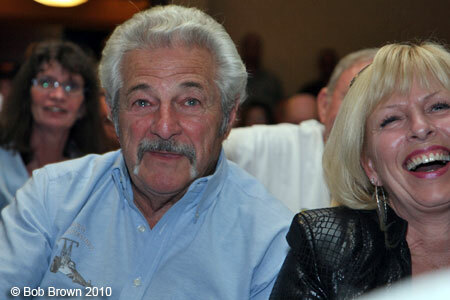 The Greek and Sandy found parts very amusing. 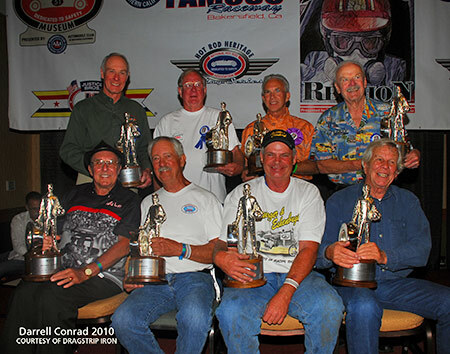 They were at Hanna's table and the rest of the story is that Chris invited Tom to be part of his crew at the NHRA Finals and Hanna had a ball doing it. 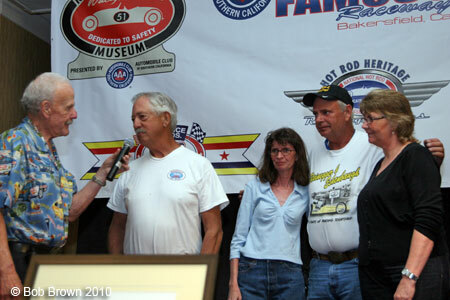 Kent Fuller, Roland Leong, Don Prudhomme and Evelyn Fuller. 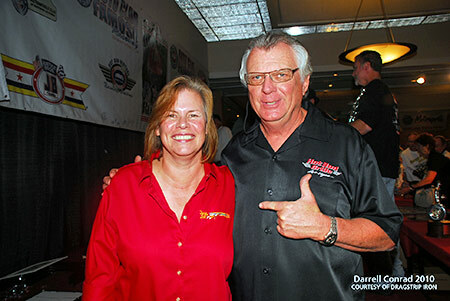 Kenny Youngblood and Jungle Pam after the awards. 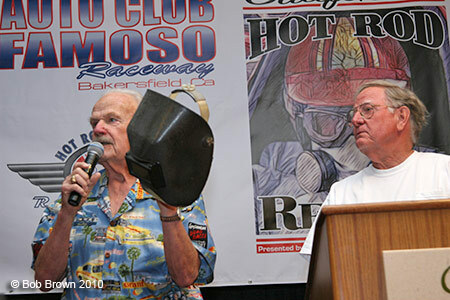 Moving outside to the cacklecars Isky and Aussie Ross Preen were hard to miss. 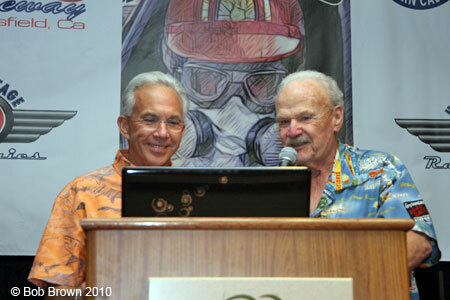 Ron Johnson with The Greek before the noise started. 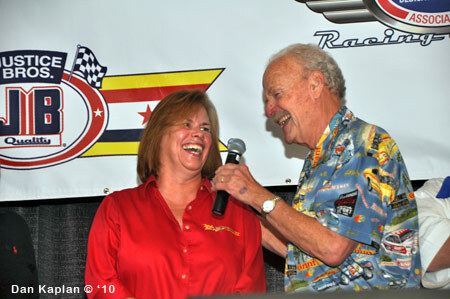 To start off, Claire Sanders fired up the Jungle Jim car. 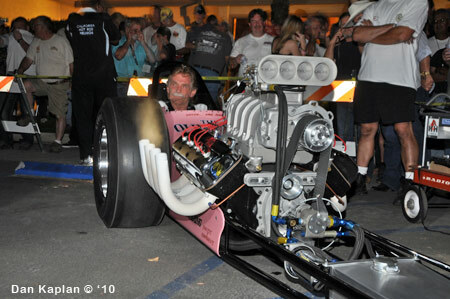 Pete Eastwood in the debut of his "Old Master" (Ed Pink) restoration. 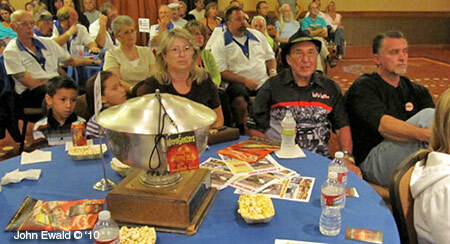 George Hutcheson in the newly restored Stoneage Man. 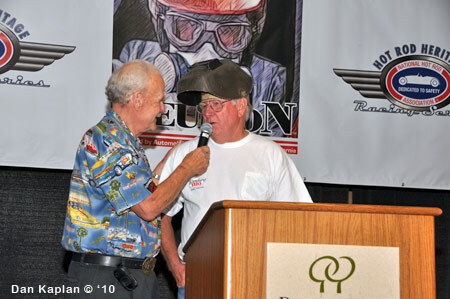 The Greek had the seat in Ron Johnson's ChiZler V.
Grand Marshall Tom Hanna capping a very memorable night.